This is a wonderful twist box designed by Anine Cleve Christensen. What makes it so special? 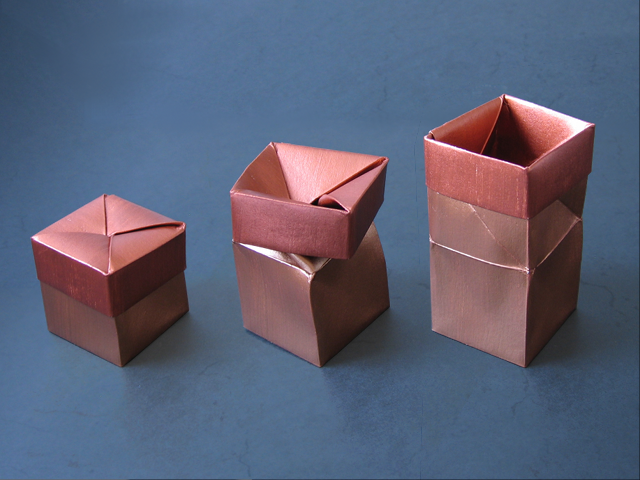 By twisting the lid, the box opens, revealing that box and lid are folded from a single sheet. When folded from duo paper the lid also has a different color than the box. Pretty awesome! why dont you make a tutorial? We'll see, depends on what Anine says to my proposal. I did send her an email a couple of days ago. This is a cool box!! I used the crease pattern and was able to make it. I also made a hexigon box using the same thought process. I know that box... by Écija! It is a great box, but it has already been invented years ago by Spanish folder Ángel Écija, great creator of clever/action models. I know that diagrams have been published in at least two publications (a special AEP mag and a 2010 book by V.Palacios). By the way: I love the metallic aspect of the paper you used: the acrylic paint over elephant hide looks great.